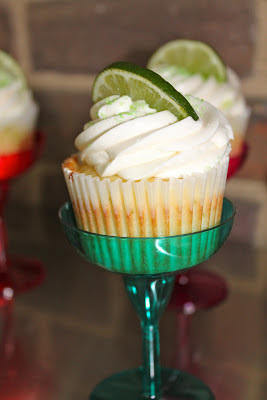 Some of the ideas and details for the Fiesta came from things I found on Pinterest (Surprise! Not. -- Are people still using that phrase?) The cupcakes were amazing. Like off-the-charts amazing. I can say that because I didn't make them. Shannon Turrell of Cupcake Delirium made them for me. 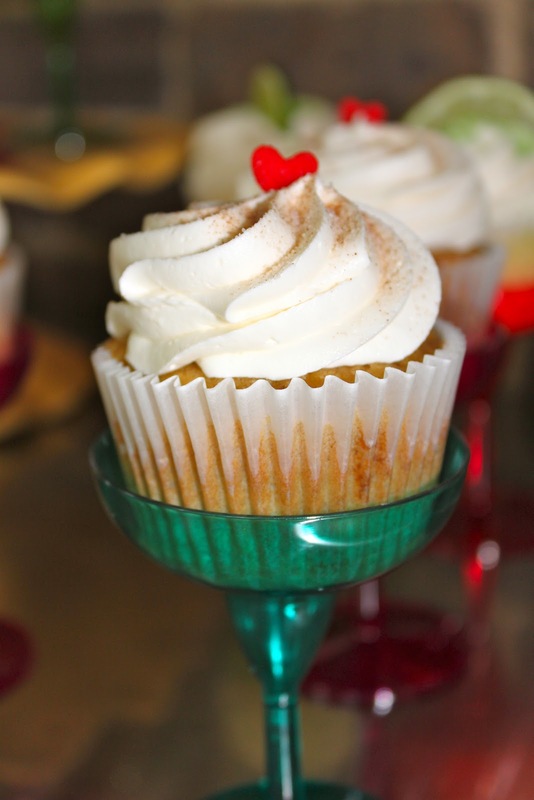 I sent her the recipe for the Margarita cupcakes and the Churro cupcakes and she did the rest. While those churro cupcakes have gooey caramel (dulce de leche) inside, the margarita cupcakes (made with tequila) were definitely my favorite. I displayed them simply in tiny plastic margarita glasses. A favorite appetizer/side dish for both adults and children were the fruit skewers: juicy, jumbo strawberries and large chunks of fresh pineapple loaded onto a wooden skewer. Simple and refreshing (and pretty to look at too). 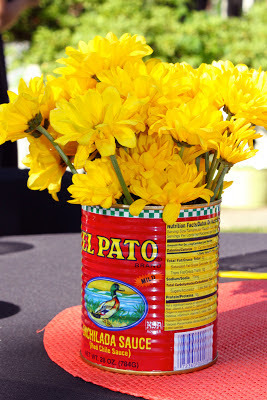 The menu cards were made with bright yellow and pink frames I found in the $1 bins at Target. 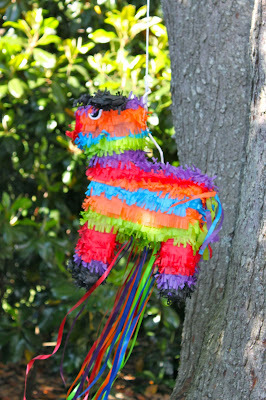 You can't have a fiesta without a piñata. I found our sweet little toro (Obviously, I named him, Ferdinand.) at Party City. I even found an authentic bag of delicious Mexican candies at our local supermercado. Cheerful daisies in Mexican food tins topped the tables. I really get completely obsessed excited about the little things. So fun!!! At first I thought it was pictures from a Pinterest post you had added to your blog....didn't realize they were actually YOUR pictures!! Great job!